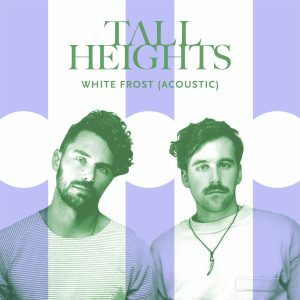 Electrofolk band, Tall Heights kicks off 2018 with the release of their aptly named latest single, “White Frost (Acoustic)”. Leaving 2017 behind with achievements such as opening for The Chainsmokers at SXSW, a national tour with Ben Folds, and an impromptu acapella performance with Josh Groban, 2018 is looking like a big year for the breakthrough act. Starting with a 40-date US Winter/Spring tour with Nashville-based folk band, Judah & the Lion and Indie-rock band, Colony House. The tour kick offs on January 31, making stops in San Antonio, Phoenix, LA, San Diego, Las Vegas, Seattle and more (Full list of dates below).